Q1. Which of the following is the IEEE standard for token ring? Answer: D. IEEE 802.5 defines token ring. Answers A, B, and C are incorrect because IEEE 802.2 defines LLC, 802.3a defines ethernet, and 802.3u defines Fast Ethernet. Q2. ANSI X3T9.5 is the specification for which LAN technology? Answer: C. ANSI X3T9.5 defines FDDI. Answers A, B, and D are incorrect because they are all IEEE standards. IEEE 802.5 defines token ring, 802.3u defines Fast Ethernet, and 802.2 defines LLC. Q3. What Data Link layer technology inserts a three-byte token (or special bit pattern) into a frame and passes it in a single direction from one node to another until it forms a complete loop? Answer: A. Token-passing inserts a three-byte token (or special bit pattern) into a frame and passes it in a single direction from one node to another until it forms a complete loop. Answers B, C, and D are all incorrect because unicast, multicast, and broadcast are all types of ethernet addresses. Answer: B, D. Token ring and FDDI use token-passing to send frames. Answers A and C are incorrect because Fast Ethernet and Gigabit Ethernet both use 802.3 MAC and 802.2 LLC headers and trailers for framing. Q5. This MAC sublayer address type identifies the MAC address of an individual LAN or NIC card. Answer: A. Unicast addresses identify the MAC address of an individual LAN or NIC card. Answer B is incorrect because multicast addresses send a frame to a group of devices in the same LAN. Answer C is incorrect because broadcast addresses send a frame to all the devices in the same LAN. Answer D is incorrect because a token is a special bit pattern used with token-passing networks. Answer: A, D. Both 0000.0C12.3456 and 0200.1111.1111 are unicast addresses. 0000.0C is Cisco’s OUI. Answers B and C are incorrect because 0100.5E12.3456 is a multicast address and FFFF.FFFF.FFFF is a broadcast address. Q7. This MAC sublayer address type sends a frame to a subset of devices on the LAN. Answer: B. Multicast addresses send a frame to a subset of devices in the same LAN. Answer A is incorrect because unicast addresses identify the MAC address of an individual LAN or NIC card. Q8. Which of the following addresses is an example of a multicast address? Answer: B. 0100.5E12.3456 is a multicast address. Multicast addresses always start with 0100.5E. Answers A and D are incorrect because both 0000.0C12.3456 and 0200.1111.1111 are unicast addresses. Answer C is incorrect because FFFF.FFFF.FFFF is a broadcast address. Q9. This MAC sublayer address type sends a frame to all the devices on the LAN. 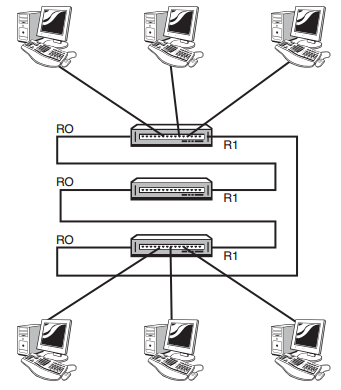 Answer: C. Broadcast addresses send a frame to all the devices in the same LAN. Answer B is incorrect because multicast addresses send a frame to a subset of devices in the same LAN. Q10. Which of the following addresses is an example of a broadcast address? Answer: C. Broadcast addresses are always represented as FFFF.FFFF.FFFF. Answer B is incorrect because 0100.5E12.3456 is a multicast address. Q11. The OSI model Data Link layer uses __________ to transport data between layers. Answer: B. Frames are used by the Data Link layer to transport data between the Network and Physical layer. Framing is the process of interpreting data that is either received or sent out across the network. Answers A, C, and D are incorrect because bits are used at the Physical layer, packets are used at the Network layer, and segments are used at the Transport layer of the OSI model. Q12. Which field of a frame is used for error detection? Answer: D. The frame check sequence (FCS) field of a frame uses a mathematical formula to determine whether any bit errors occurred during data transmission. Answer A is incorrect because Service Access Point (SAP) identifies the upper-layer protocol such as IP. Answer B is incorrect because DSAP is the destination SAP or destination upper-layer protocol. Answer C is incorrect because SSAP is the source SAP or the source upper-layer protocol. Answer: B, C. IEEE 802.3ab and 802.3z define Gigabit Ethernet standards. Answers A and D are incorrect because 802.3u defines the Fast Ethernet standard, and 802.3ae defines the 10 Gigabit Ethernet standard. Q14. Bridges and switches segment a network and create an additional _______________ domain for each segment. Answer: A. Collision domains are increased with the addition of bridges or switches on a network. Answer B is incorrect because routers create additional broadcast domains. Answers C and D are incorrect because unicast and multicast are both addresses used by ethernet. Q15. Bridges and switches examine the __________________ of each inbound frame to learn MAC addresses. Answer: C. The source MAC address of an incoming frame is examined by a bridge or switch to learn the MAC address for the bridge table. Answers A and B are incorrect because multicast and broadcast addresses can never be the source MAC address. Answer D is incorrect because the destination MAC address is not used by a bridge or switch to create the bridge table. Q16. Which device uses ASIC hardware chips for frame forwarding? Answer: D. Switches use ASIC hardware chips for frame forwarding. Answers A and B are incorrect because hubs and repeaters do not forward frames because they are Physical layer or Layer 1 devices. Answer C is incorrect because bridges use software for frame forwarding. Q17. With a 10Mbps ethernet LAN, dedicated bandwidth enables a switch port to guarantee what data transmission speed? Answer: A. 10Mbps is guaranteed with dedicated bandwidth on a 10Mbps ethernet LAN. Answers B, C, and D are incorrect because other speeds of 100, 1000, and 10,000Mbps are all faster speeds that require a different ethernet LAN standard. Q18. This Data Link protocol eliminates loops that are caused by redundant connections. Answer: D. Spanning Tree Protocol (STP) is a Data Link protocol that eliminates loops caused by redundant connections on a LAN. Answers A and B are incorrect because cyclical redundancy check (CRC) and frame check sequence (FCS) both provide error detection. Answer C is incorrect because CSMA/CD is an algorithm that is used for arbitration on an ethernet network. Q19. This communication mode allows for only one-way data transmissions at any time. Answer: C. Half-duplex allows for only one-way data transmissions at any time. Answers A and B are incorrect because 10Mbps and 100Mbps are speed classifications primarily associated with ethernet LANs. Answer D is incorrect because full-duplex allows for two-way data transmissions. Q20. This communication mode allows for simultaneous two-way data transmissions. Answer: D. Full-duplex allows for simultaneous two-way data transmissions. Answers A and B are incorrect because 10Mbps and 100Mbps are speed classifications primarily associated with ethernet LANs. Answer C is incorrect because half-duplex allows for only one-way data transmissions at any time. Answer: Token-passing is a Data Link protocol that inserts a three-byte token (or special bit pattern) into a frame and passes it around the network in a single direction from one node to another until it forms a complete loop. The node that has possession of the token is the only one that can send data at any given time on that LAN. Because only one node can send data at a time, collisions are avoided. Q22. List the characteristics of a token ring network. Q23. List the characteristics of an FDDI network. Q24. Define unicast, multicast, and broadcast. Answer: A unicast address identifies the MAC address of an individual LAN or NIC card. A multicast address forwards a frame to a subset of devices in the same LAN. IEEE ethernet multicast addresses always begin with 0100.5E in hexadecimal format. The last three bytes can be any combination. A broadcast address sends a frame to all devices in the same LAN.Broadcast addresses are always the same value, which is FFFF.FFFF.FFFF. Answer: CSMA/CD or Carrier Sense Multiple Access Collision Detection is an algorithm that sends a jam signal to notify the devices that there has been a collision. The devices then halt transmission for a random back-off time. Q26. What are the primary tasks performed by both bridges and switches? Answer: The primary tasks performed by both bridges and switches are as follows: The source MAC address of every inbound frame is examined to learn its MAC address. You can decide whether to forward or filter a frame based on the destination MAC address. Eliminate loops that are caused by redundant connections by configuring Spanning Tree Protocol (STP). Q27. Describe half- and full-duplex. Answer: Half-duplex allows for one-way communication, which means that a device can only send or receive a data transmission at any given time. As a part of a shared collision domain, hubs must use half-duplex. Full-duplex allows for two-way communication, which means that a device can simultaneously send and receive data transmissions. Full-duplex is available with dedicated switch port connections to a single device. If a switch port connection is configured for full-duplex, the CSMA/CD algorithm must be disabled. Also, an ethernet connection set for full-duplex allows for 100% transmission speeds in both directions. Answer: Microsegmentation occurs when a switch creates a dedicated path for sending and receiving transmissions with each connected host. Each host then has a separate collision domain and a dedicated bandwidth. Q29. In the accompanying graphic, what is the name for the section of the MAC address marked as unknown? Answer: D. The organizationally unique identifir (OUI) is assigned by the IEEE to an organization composed of 24 bits, or 3 bytes, which in turn assigns a globally administered address also comprised of 24 bits, or 3 bytes, that’s supposedly unique to each and every adapter it manufactures. Q30. _____________on an Ethernet network is the retransmission delay that’s enforced when a collision occurs. Answer: A. Back-off on an Ethernet network is the retransmission delay that’s enforced when a collision occurs. When that happens, a host will only resume transmission after the forced time delay has expired. Keep in mind that after the backoff has elapsed, all stations have equal priority to transmit data. Q31. On which type of device could the situation shown in the diagram occur? Answer: A. When using a hub all ports are in the same collision domain which will introduce collisions as shown between devices connected to the same hub. Q32. In the Ethernet II frame shown here, what is the function of the section labeled “FCS”? A. Allows the receiving devices to lock the incoming bit stream. Answer: B. FCS is a fild at the end of the frame that’s used to store the cyclic redundancy check (CRC) answer. The CRC is a mathematical algorithm that’s run when each frame is built based on the data in the frame. When a receiving host receives the frame and runs the CRC, the answer should be the same. If not, the frame is discarded, assuming errors have occurred. Q33. The contention method used by Ethernet is called ____________. Answer: B. Ethernet networking uses a protocol called Carrier Sense Multiple Access with Collision Detection (CSMA/CD), which helps devices share the bandwidth evenly, while preventing two devices from transmitting simultaneously on the same network medium. Q34. In which if the following situations can you not use full-duplex? Answer: D. Hubs are not capable of providing a full-duplex connection. Q35. Between which systems could you use a cable that uses the pinout pattern shown below? Answer: D. The cable shown is a straight-through cable which is used between dissimilar devices. Answer: B, C. The high-order bit is the Individual/Group (I/G) bit. When it has a value of 0, we can assume that the address is the MAC address of a device and that it may well appear in the source portion of the MAC header. When it’s a 1, we can assume that the address represents either a broadcast or multicast address in Ethernet. Q37. What type of cable uses the pinout shown here? Answer: B. In creating the gigabit crossover cable, you’d still cross 1 to 3 and 2 to 6, but you would add 4 to 7 and 5 to 8. Q38. When configuring a terminal emulation program which of the following is an incorrect setting? Q39. Which part of a MAC address indicates whether the address is a locally or globally administered address? Answer: D. When set to 0, this bit represents a globally administered address, as by the IEEE, but when it’s a 1, it represents a locally governed and administered address. Q40. What cable type uses the pinout arrangement shown below? Answer: B. You can use a rolled Ethernet cable to connect a host EIA-TIA 232 interface to a router console serial communication (COM) port. Q41. Which of the following is not one of the actions taken in the operation of CSMA/CD when a collision occurs? A. A jam signal informs all devices that a collision occurred. B. The collision invokes a random backoff algorithm on the systems involved in the collision. C. Each device on the Ethernet segment stops transmitting for a short time until their backoff timers expire. D. All hosts have equal priority to transmit after the timers have expired. Answer: B. The collision will invoke a back-off algorithm on all systems, not just the ones involve in the collision. Q42. Which of the following statements is false with regard to Ethernet? A. There are very few collisions in full-duplex mode. C. The host network card and the switch port must be capable of operating in fullduplex mode to use full-duplex. D. The default behavior of 10Base-T and 100Base-T hosts is 10 Mbps half-duplex if the autodetect mechanism fails. Answer: A. There are no collisions in full-duplex mode. Q43. In the diagram below, identify the cable types required for connections A and B. Answer: B. The connection between the two switches requires a crossover and the connection from the hosts to the switches required a straight through. Q44. In the work area below match the cable type to the standard with which it goes. Answer: The given cable types are matched with their standards in the diagram below. The given cable types are matched with their standards in the diagram above. Q45. The cable used to connect to the console port on a router or switch is called a __________ cable. Answer: B. Although rolled cable isn’t used to connect any Ethernet connections together, you can use a rolled Ethernet cable to connect a host EIA-TIA 232 interface to a router console serial communication (COM) port. Q46. Which of the following items comprise a socket? Answer: B. If you’re using TCP, the virtual circuit is defied by the source and destination port number plus the source and destination IP address and called a socket. Q47. Which of the following hexadecimal numbers converts to 28 in decimal? Answer: A. The hex value 1C is converted as 28 in decimal. Q48. What cable type is shown in the below graphic? Answer: A. Fiber optic cables are the only ones that have a core surrounded by a material called cladding.